Have you ever priced travel journals online? They are expensive. This travel journal diy is a great alternative, and lets you to create something that is more personalized. 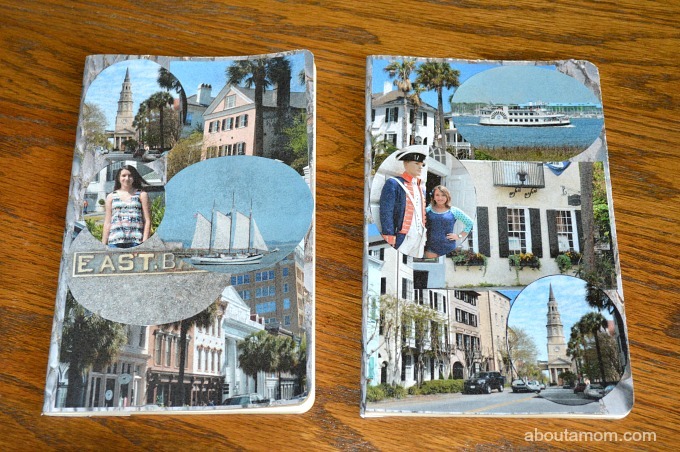 We used pictures from our recent trip to Charleston to make these journals. I love the idea of having pictures from past trips and vacations on our journals for inspiration. Before blogging, there was journaling. As any adventurer does, I like to take note, collect and gather my travel experiences to look back on at a later time. I still enjoy putting pen to paper to record my thoughts. In it’s simplicity, this journal is perfect for tucking into your backpack and taking along on your next adventure. Print a variety of photos from your past travels in various shapes and sizes. I printed them out on multipurpose copy paper. Don’t they look great? That’s because of the nifty new HP Envy 5660 e-All-in-One printer I received for my participation in the #HPSmartMom Panel. It does an amazing job! Once your pictures are printed, cut them into a variety of shapes. Lay them out on top of the journal to get an idea of placement. It’s okay to overlap them – I encourage it. I recommend choosing one picture that you want to use as your background image and print it large enough to cover the entire front of your notebook. We used a picture taken of a cobblestone road in Charleston. It’s the perfect neutral background image. Cover your work space with newspaper. The spray adhesive can be a bit messy. It also gives your pictures a bit of a matte finish when it dries, making it look a little aged which I just love. Next, start spraying and gluing. 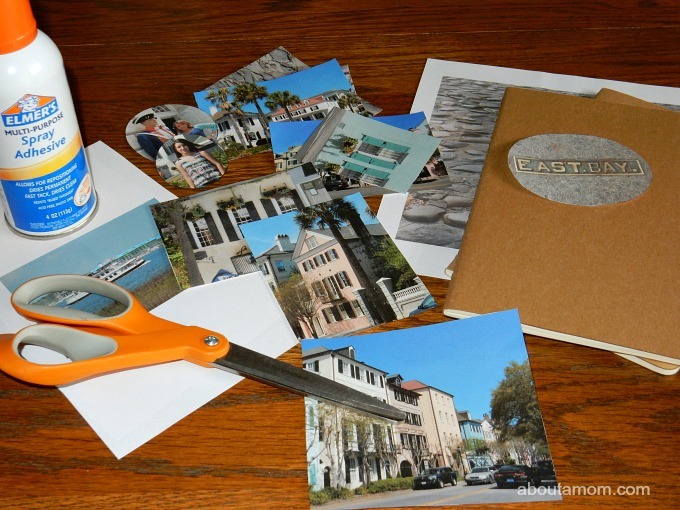 Spray some adhesive onto the back of each picture and gently place it onto the notebook. I warned you – this can get messy! Use a pair of scissors to remove any overlap from the edge of the notebook. That’s it. Easy peasy! I recommend tucking an envelope inside of your journal, to collect keepsakes and mementos. What a cool project! I’ve never done much paper crafting like this, but I’ve always wanted to. That’s such a lovely way to preserve wonderful travel memories and moments. I love it. This is such a wonderful idea! I’ve got a bazillion photos from my last two trips, so I think I’ll give this a try. I’m so interested in keeping a travel journal. I think it’s the neatest little thing. That’s such a creative way to document your travels. I like the idea of making an overlapping collage. This is such a fun and creative idea, especially for kids. I am going to have my children make one so they can treasure the trips we take for years to come. This is a cute and fun idea! I’m a huge journal gal so this just screams at me! I don’t travel much though, so when I do I will have to try to do tbis! I love these journals! It is so cool to have your own photos on the outside to compliment the memories you jot down inside. What a cute way to commemorate your trip. Back when I only had one child and an occasional minute to myself (the good ol’ days), I was a pretty avid scrapbooker. It’s all gone by the wayside, but I’ve got all of the supplies still. I could probably manage this! I love making my own little journal books. They are so expensive and it is so much cheaper to just buy a simple notebook and embellishments. Yours turned out really cute! Those are just copy prints, huh? They do look really great and I love this idea! This is a great way to make a travel journal. I will have to make one for my next trip. i love how personalized it is! It would be so fun to take with you on adventures! Wow this is great, I would have thought it was professionally made! I will have to try this out! I think this is a ggreat way to remember vacations. Awesome pic. How creative is this! I love the idea. Looks great too! What a fabulous idea! I can think of a few of the places it would be great to make these for our pictures. Just THIS: “Before blogging, there was journaling.” You made me giggle with that one! This is such a cool idea! We’re going on our 1st cruise this summer. I’m totally making one of these! As a traveler, I just love this idea! I’ve got so many to start working on now! This is a fun way to keep your memories. I have made photo books with pics of my travel adventures. This is a great idea! 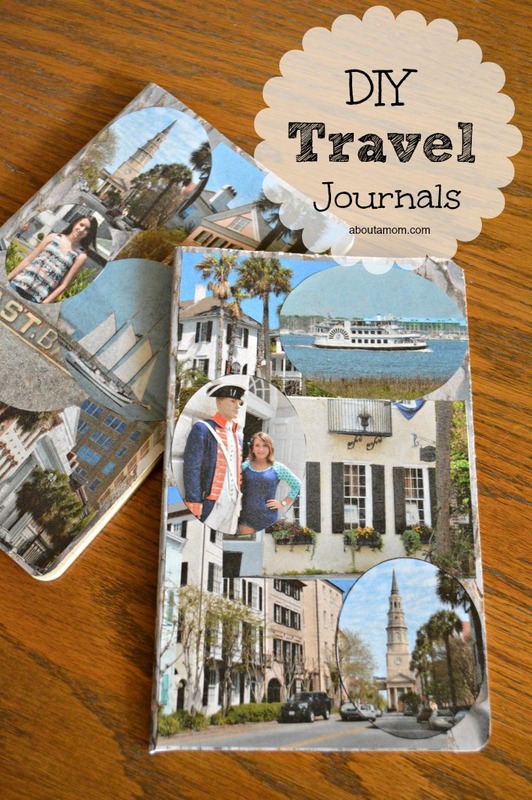 I love making travel journals and they’re wonderful travel keepsakes – better than souvenirs! These journals are amazing! What fabulous keepsakes and memories. Please come share your blog posts over at the Home Matters Linky Party! We’d love to have you for a visit. The Door is OPEN. Those journals are so sweet! Such a great idea! Thanks for sharing at Idea Box. What a great project…I love keeping a journal when we travel…but I’ve never decorated my own! Thanks for sharing this with us at #FoodieFriDIY! Pinning! Really cute! Love this idea! I love this! I can imagine all kinds of ways to make journal like this, and what a nice way to make a memory of a trip and/or vacation! this is such a great idea for a diy! I really like it! I just love the idea of this DIY Travel Journal! It would make such a nice gift for someone who travels a lot.